Happy Birthday Daphne du Maurier! 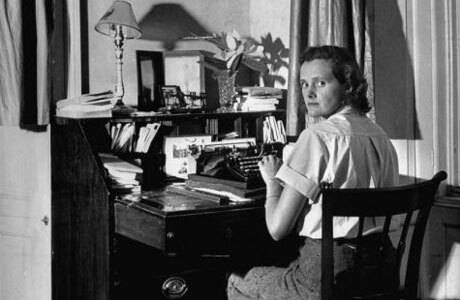 On May 13, 1907, Daphne du Maurier was born the middle child of Gerald du Maurier and Muriel (Mo) Beaumont. She became a prolific writer of novels and short stories. She would have been 103 today. When she died in 1989, she left a request that her childhood diaries would not be opened until 50 years after her death. What secrets could be in those diaries? She was as mysterious in death as she was in life. I've been reading Captivated by Piers Dudgeon about the strange relationship between JM Barrie (Peter Pan) and the du Maurier family. I'll have more on that next week. This is also the official start of the Daphne du Maurier Challenge. Welcome all participants! You can leave your links to Daphne du Maurier reviews on the review blog. You'll find the link in the sidebar whenever you complete a review. If you haven't signed up but would like to, join in anytime between now and April 19, 2011. Ohmigosh! So glad to have time left to celebrate the day. I'm going to scrounge around my book piles and shelves so I can read a short story from Don't Look Now. Great photo of Daphne at her desk! I really should reread Rebecca. I remember liking it a lot!